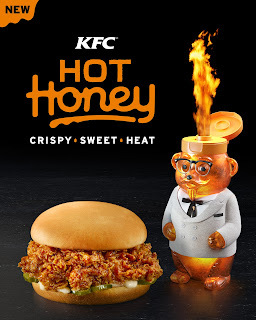 Kentucky Fried Chicken has brought in the suite in the heat to its famous fried chicken with the newest menu item, Hot Honey. Inspired by a trending flavor mash-up of a golden honey blended with mild peppers, the new flavor as an unexpectedly delicious burst of sweet honey with a spicy kick of pepper to KFC’s fried chicken. Along with its new Hot Honey flavor, KFC’s newest kernel is unlikely any of his predecessors because, well, he’s a bear. Just like his human inspiration, Colonel Sanders, Colonel bear is obsessed with selling the KFC fried chicken. Sometimes Colonel Baer takes his dedication a little too far, leading to the sweet little bear’s fiery side coming out. Hot Honey is available at participating US restaurants as a Crispy Colonel Sandwich, Extra Crispy Tenders, Chicken Littles, and Extra Crispy Chicken. It tastes perfectly paired with Lipton brisk raspberry tea as a sweetness in the complexity of the raspberry in honey work with the heat from the peppers and the tannins from the teeth for a perfect pairing.